Yesterday, in case you missed it, off year elections took place across America, most notably in Virginia, New Jersey and New York, the results ho-hum, or going according to the pundits. 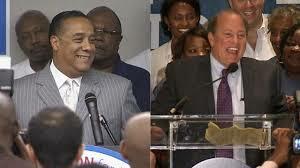 There was one race, however, that grabbed my attention–the election of Mike Duggan as Detroit’s new mayor. Duggan happens to be white in a city 80% black. He’s the first white in 40 years elected to that office. It’s understatement, of course, to say he faces a gargantuan challenge in a floundering, virtually bankrupt, city plagued with endemic poverty and violent crime. Detroit, by any measure, has become a largely vaporized city, with empty lots and boarded-up houses. When I lived there in the 60s, the factories still hummed and population stood well over a million in our nation’s fifth largest city. Today it’s shrunk to just over 700,000 as thousands of the city’s middle class blacks have joined long-gone whites in the suburbs. In Detroit, it isn’t about color anymore, but about desperation. I find a silver lining in this sad news–that yes, a populace rightly harboring resentment for past wrongs can move past bitterness, and even prejudice, to embrace giving the tools to the person who can get the job done. I would love it just as much to see white majorities reciprocate. We have a black president, historic–yes–but the truth is the majority of whites voted against him both in 2008 and 2012. I’d like to think it didn’t come down to race, but I shed naivety when I grew up, and I’m wary. But for today, I’m ecstatic about what happened in Detroit yesterday and you should be too, given our still all too prevalent tensions among races and ethnicities, despite our nation’s model, e pluribus unum (one out of many). Only a few months ago wounds reopened with the Zimmerman trial. The bottom line is that what matters most isn’t color, but compassion centered in human need. Yesterday, Detroit paid earnest on the city’s–and nation’s–future. This entry was posted in Politics, Reflections and tagged Detroit, detroit election, Mike Duggan. Bookmark the permalink.